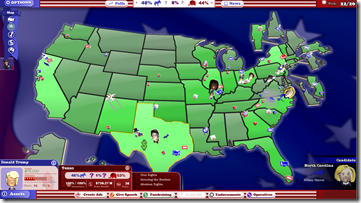 Stardock has released the final update for its political strategy/simulation game, The Political Machine 2016. The new version adds “Election Integrity” as an issue, updates the Probing HIllary’s emails issue and provides some new random events such as Internet Revelations, Foreign interference, Internal party revolt and more. The Political Machine 2016 requires a Windows PC with at least Windows Vista or later. It can be played single player against the AI, multiplayer versus opponents over the Internet or in Sim mode where players can select from dozens of candidates and see how they stack up. While played as a PC game, the simulation underneath is based on years of polling and demographic data. Visit www.politicalmachine.com to learn more or go to its Steam page at http://store.steampowered.com/app/404620. You can contact Stardock at press@stardock.com.